Booked your flight and hostel to Amsterdam with friends? Then now it’s time to look into what you want to do once you’re in the city of cheese and fries. Well, you’ve got to try both the cheese and the fries of course. But if you want to discover the beauty of the city, be sure to plan a boat trip on the beautiful canals of Amsterdam. This is an experience you won’t regret! 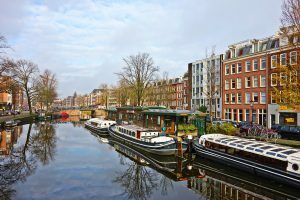 There are a lot of companies that offer boat trips on the canals of Amsterdam. You can just pick one and guess it will be good. It probably won’t be a dissappointment as they all show you the city with a tour guide. You can even go on a hop on hop off boat! But you can also arrange something a little bit more special. Are you planning on visiting Amsterdam with a few friends? Then a diner on a boat would be a fun thing to do. Did somebody say pizza? Oh yes, we did! You can cruise the canals of Amsterdam while eating a tasty pizza with friends. On board you can choose toppings for your pizza and it will be prepared right before your nose! The boat trip takes about 1 ½ hours. During this time you can also have as many drinks as you want. Sounds good, right? Well, to top it off, you will also get a brownie for dessert. They will make sure you won’t leave the boat feeling hungry. It’s not only about the food on the boat.. There will also be a guide to tell you about the history of Amsterdam. You can ask him or her anything! They are happy to explain all about it. You will pass the old houses at the canals, some museums, bridges and churches. Of course with all the cosy lights turned on (not during summer as it’s still light in the evening). A huge advantage of the pizza boat is that they have panoramic windows. So you won’t miss a bit of the city at night. And if it’s a very bright evening, you can look up into the stars. As said, you won’t forget such memories in the beautiful city of Amsterdam. When visiting Amsterdam, be sure to book a nice hostel for yourself. Hostel Amsterdam Sarphati offers you a comfortable place to stay at an affordable rate.